Ribble caused something of a sensation at the start of the motorway era by introducing the Gay Hostess double deck coaches. Having covered many miles they were replaced in 1970/71 by a new design of ECW bodied VRL coaches, sale following on from a prototype built in 1968. These were unusual in having longitudinal engines rather than transverse, Ribble choosing the Leyland 0.680 Power Plus engine for this application. Although very impressive looking vehicles they developed a reputation for unreliability and were supplanted on long distance work by Leopard coaches. 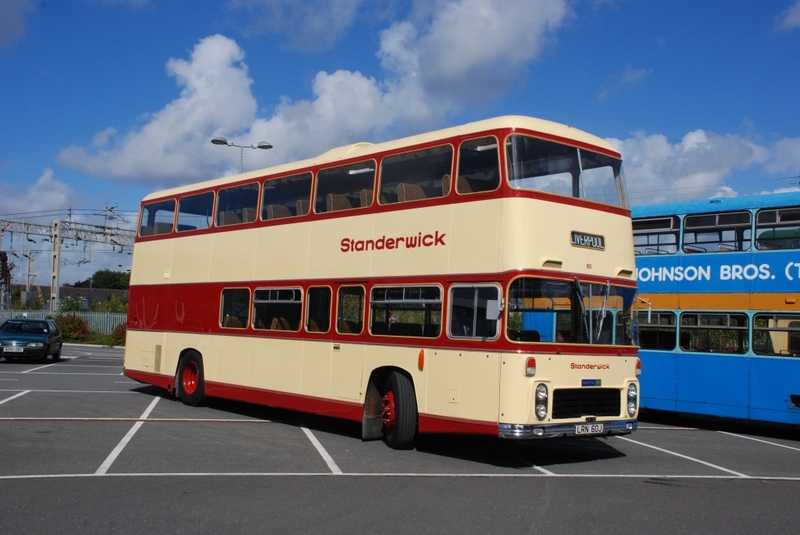 In total 30 were acquired and all were in the Standerwick fleet until 1974 when coaching operations were transferred to National Travel Northwest. 60 was acquired by RVPG member Les Scott who arranged for the coach to be professionally restored and it was put back into its original cream and red livery. In 2012 a consortium of RVPT members bought it from Les (who retained a stake) and it moved into the Trust collection. It is operational and has attended a number of rallies since joining the group.